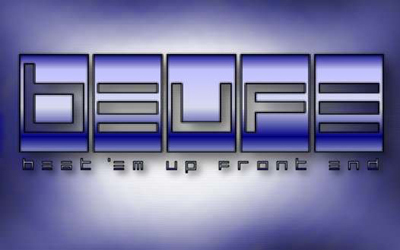 BEUFE - The Beat-em Up Front End! BEUFE will be released on the 4th of July 2001. You will be able to download BEUFE from this page when it's released! BEUFE Work in Progress: Keep up to date on all things BEUFE! BEUFE Screenshots: Want to know what BEUFE looks like? You do? Then click that link right now soldier! BEUFE Download: Download BEUFE from this page!